As much as everyone tries, a lot of the new fancy luggage just doesn't hold up to the classic appeal of saddlebags. You know, I couldn't really tell you why they rank higher than tail bags, tank bags, or sissy bar bags, but they do and probably always will. 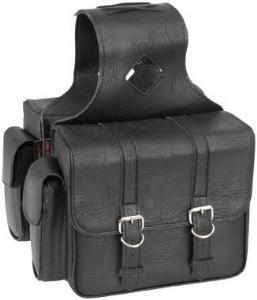 Now, there have been some advances in saddlebags as well, but if you're looking for a good, old-fashioned set of saddlebags, River Road's Compact bags are almost perfect. They are inexpensive, at around $70 depending on your vendor. You have the option of piped or braided edges, with or without studs. So that covers most varieties of classic bags. Reinforced walls and base provide strength and help these bags maintain their shape. My bags are starting to split at the seams because they lack reinforcement, so trust me it's a worthwhile feature. There are some modern features to these classic-looking bags. They have hidden quick-release buckles for added convenience. On the back, or the front depending on how you mount them, there are pockets. These are great for sunglasses, cameras, and anything you might want to get to in a hurry. Earlier, I mentioned that these are "almost" perfect. Well, they are synthetic leather. They'll look real and offer UV protection, but it's not a true classic style if it's not leather, so they don't quite cut it. The price may make up for that small drawback, and the 1-year warranty is certainly appealing. Just be sure you subject them to all the rigors in that first year to be sure they're tough enough for you.